Technology has changed lives in many ways, and one of these ways in the field of sign language is with finger spelling machines. Finger spelling machines make life a lot easier for non sign language users and people who are just starting to learn sign language and other new ways of communicating. What is a Finger Spelling Machine? A finger spelling machine is generally seen in the format of a piece of software for your computer. When the software is loaded onto the computer it enables people to type in a word and then translate it into a finger spelt word. It does this using short videos within the software. Where Can You Get a Finger Spelling Machine? Finger spelling machines are available from many places including the Royal National Institute for the Deaf (RNID) and many of them have varying degrees of complexity. Some are free and some cost a small amount of money. If you are having trouble finding a finger spelling machine to suit your needs then the RNID should be able to advise you as to one which will suit you and will probably have one available themselves which does the job. The more basic ones will simply show a video of the word you type in as a fingerspell word. 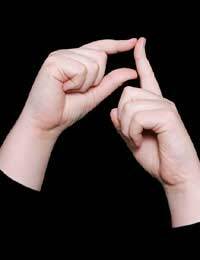 But the more complex you get and the more you pay, the more things you can do with a finger spelling machine. Some allow you to change the speed at which the word is spelt out so if you are not quite catching it you can look again on a slower speed. Why Use a Finger Spelling Machine? If you always rely on finger spelling machines to learn words you may negate all of the advantages of them. But if you use them to learn rather than rely on they can be a great help. They will help you to remember the letters in a way that just seeing someone demonstrate them alone may not. And in addition, the machines will help you to pick up the way the letters work with each other and the way fluent sign language users segue neatly from one letter to another, something which beginners have trouble with doing at speed. Some finger spelling machines can be used especially for learners of sign language with particular needs, for example, left handed people. Because sign language uses a lead hand, this is usually the right hand so left handed users sometimes find it tricky to mirror this. Thus a finger spelling machine will aid you in this. But for the most part finger spelling machines are useful for everyone, regardless of hand usage. They are simple to get to grips with and offer an easy way to pick up letters without spending hours in a classroom.